along with my previous wallpaper, "Intelligence Rules the World", I continue to make wallpaper based on Katekyou Hitman Reborn! 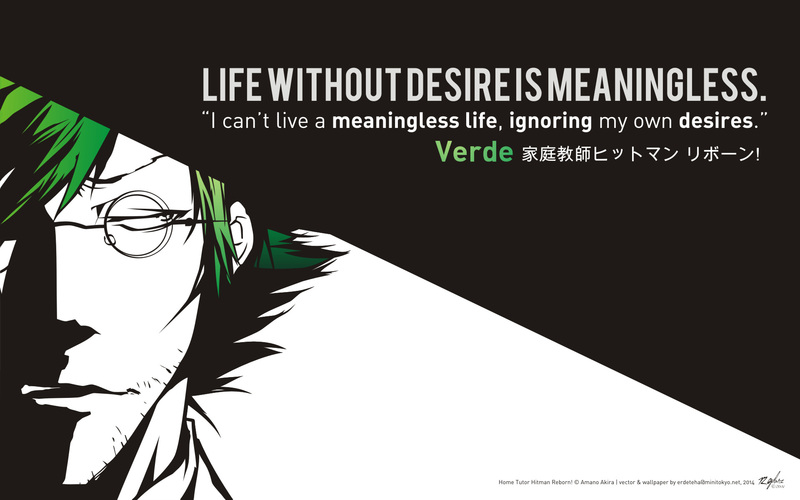 This time, I choose Verde, the lightning arcobaleno. I took quote from him saying 'bout his madness of research. Well said, and I also agree, that life without desires is meaningless. We must have desires and dreams, then try to achieve it! Vector of Verde taken from this scan http://static2.minitokyo.net/view/45/07/422895.jpg, still using CorelDRAW to trace it. It only took approximately 3 hours (including lay-outing).